The other week I was sectioning a rabbit for some rabbit stew. This process uncovered a gaping hole in our arsenal of kitchen tools. We needed a meat cleaver that could easily cut through the ribcage and spine of an animal. The meat cleavers offered by today's knife producers are shiny, modern looking, and expensive. I wanted something with a little more character, something that a deranged ax murder might wield in a horror movie. So we decided to go the antique/vintage route and get an old cleaver. 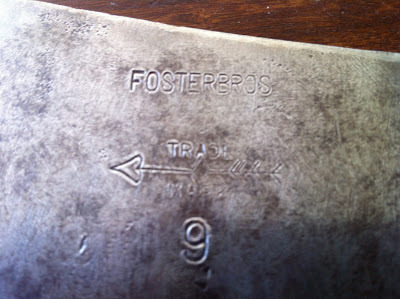 After much searching, I found this Foster Brothers cleaver on ebay (at a fraction the cost of a new one). The cleaver is 17 inches long with a 9 inch blade and weighs in at 3 lbs. It may be a bit overkill for home use, but looks awesome hanging on the kitchen wall. Foster Brothers was started in 1878 by Frank and Allie Foster in Fulton, (upstate) New York. 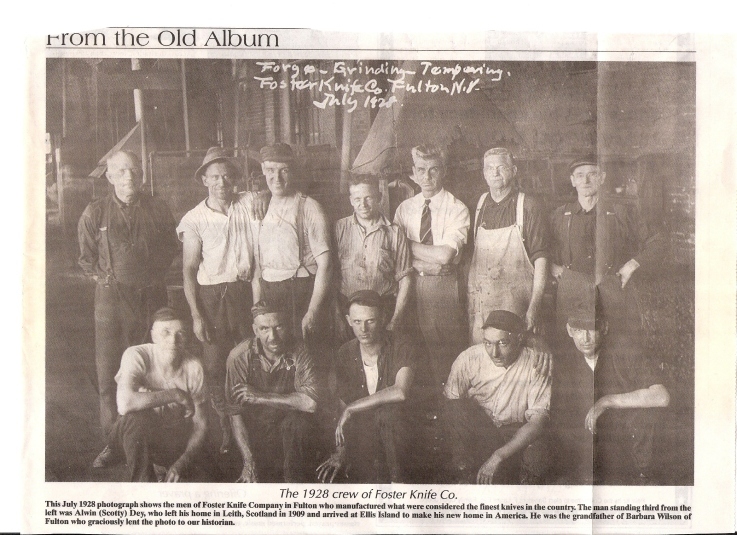 Within a few years all of the Foster Brothers were involved in the business. The Foster brothers were heavily involved in Fulton politics which formally became a city in 1902. 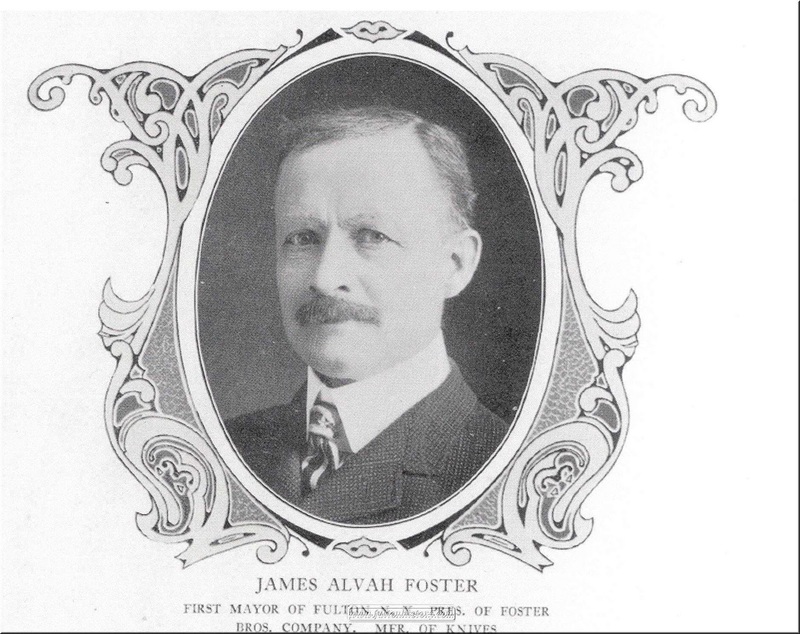 JA Foster served as Fulton's first mayor and John M. Foster served as the third. In addition to serving as mayor, the Foster boys were involved in all aspects of early Fulton politics serving on Board of Public Works (JA Foster), Clerk (Langdon Foster), Board of Fire and Police (John Foster, C. Earl Foster, CF Foster), and the Board of Health (JA Foster CF Foster LC Foster). Foster Brothers was acquired by Chatillon around 1900, but continued to produce knives in the Foster factory. 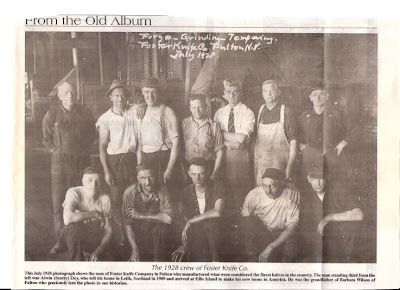 Around the turn of the century they mechanized the factory adding modern tools like power hammers, all knives prior were hand worked at an anvil. At the height of pre-WWII production they made over 500 different sizes and styles of knives the largest being a splitting knife for meat packers that had a 2 foot long blade and a 2 foot long handle. 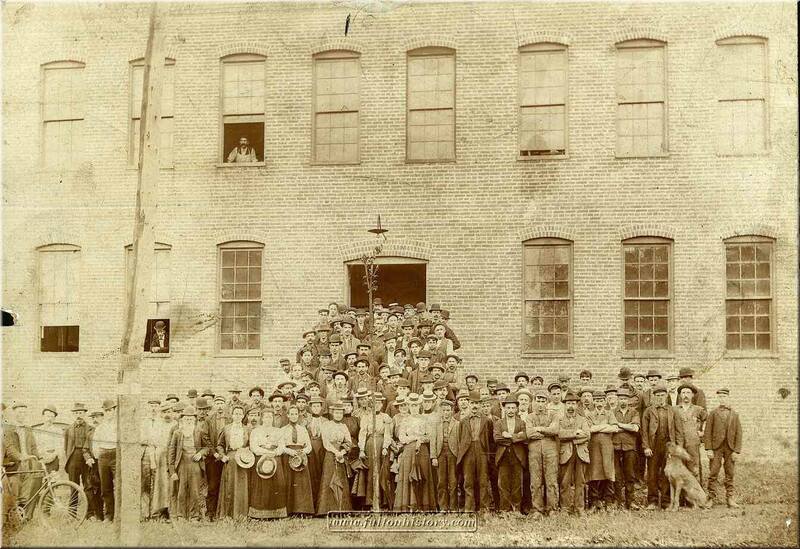 "On December 20th 5 men employed in grinding knife blades at the factory of the Foster Brothers' Knife Works at Fulton went on strike for an advance in wages on certain lines of work. Their employers refused to concede their demand. Several conferences were held, but without result, and on December 26th the strikers gave up their contention and resumed work at the old rate of wages." No surprise since the Foster Brothers seemed to run things back then. nice work chuck, all thoes years of watching PBS have paid off! Sweeny Todd!! A+ for researching, though. I wonder how many people have used that knife before/how many creatures it has butchered. The number 1107 is also on the blade. I so much appreciated your article. I was also having trouble finding information on the internet. I recently inherited a Foster Bros. meat cleaver that has a 13" blade, old wooden handle that has a bend in it. The handle is wrapped with a thin rope. The handle is about 18". The story is my great great grandmother used it for slaughtering. So, I'm assuming it was made btw 1878 and 1890, based on the information you provided. Thank you. Hey! I just bought my Foster Bros. cleaver and decided to do more research on it. This site will tell you what the numbers mean, it's a carbon/alloy chart. I'm trying to date mine, but I'm having a lot of trouble with that. It has 3 rivets and is the 2190. Maybe someone can help me. I have a cleaver that is marked Solid Steel..underneath is Foster Bros, and under that is just MARK...then just nest to the handle it's market 280 The cleaver is 14" straight across the top, the blade at it's widest is 4 1/4 " ...What do I have? I know for a fact that it was being used in the 1930's...it also has three brass rivets on the handle. The blade itself is 7" across the top and 8" at the bottom. help|! 25 in ocverall fulltang cleacver....elecven and 3/4 in blade..\13and a half handle..what is it?? I have an old cleaver it is marked FOSTER BROS. under that SOLID STEEL. but what I have not seen before are the initials LC stamped and C2190. Anyone else ever seen this? Foster Bros usumc? 8. Have not found any info on the usumc part. Any ideas? My cleaver was my fathers I says Foster Brothers solid steel 1138 could you tell me how old it is? For more info on these blades, contact Dan aka @upbeatvintage (on twitter and Instagram) he restores these blades and is a wealth of knowledge. Just purchased this same clever with, only difference is mine has number 7. Thanks for the info. Greatly appreciated.